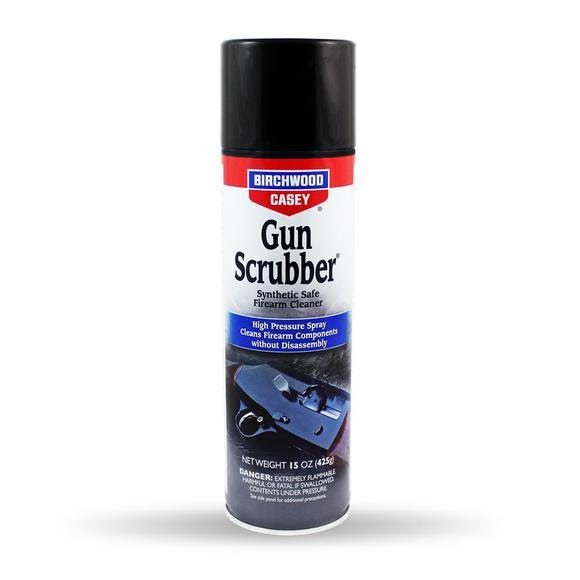 Cleaning your firearm just got a whole lot easier and faster thanks to Birchwood Casey's Gun Scrubber® Firearm Cleaner. Gun Scrubber® Firearm Cleaner is a pressurized, fast evaporating firearm cleaner that cleans internal metal firearm parts and firearms effectively. Cleaning your firearm just got a whole lot easier and faster thanks to Birchwood Casey &apos;s Gun Scrubber® Firearm Cleaner. Gun Scrubber® Firearm Cleaner is a pressurized, fast evaporating firearm cleaner that cleans internal metal firearm parts and firearms effectively. While safe for firearm usage, the solvent may harm finished surfaces, plastics, laminates, composites, rubber grips or other materials used in the construction of today&apos;s firearms. Always test in an inconspicuous area to ensure product will not harm surfaces.